The family of Robert Yin and the SPIRIT Foundation are pleased to announce the start of the 3rd Annual 2012-2013 SPIRIT Scholarship, coinciding with the 23nd birthday today of Robert Yin. 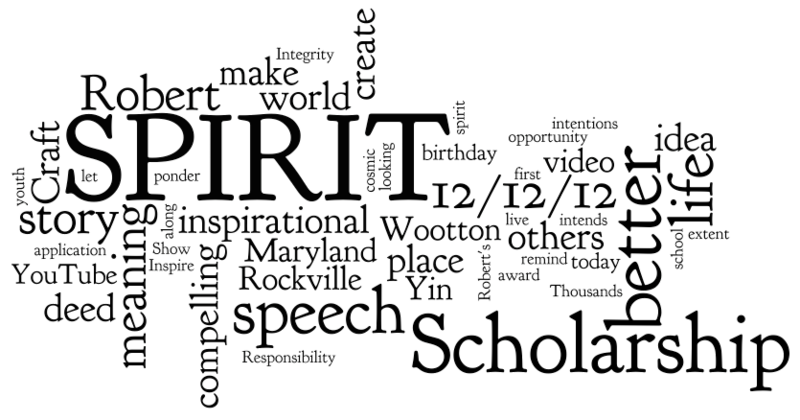 The SPIRIT Scholarship is an award to a college-bound senior from Thomas Spriggs Wootton High School in Rockville, Maryland. By the end of the 2011-2012 school year, one individual from the Class of 2012 will win the award of $5000. There may be additional $100 awards for outstanding video ideas. * There also will be one runner-up award at an amount to be determined. 12/12/12 is an auspicious, "carpe diem" kind of day. It's a once in a millennium opportunity to ponder what life intends. To the extent we can ascribe meaning and cosmic intentions to 12/12/12, along with Robert's birthday, then let today remind us to live with "spirit". For the SPIRIT Scholarship, we are looking for youth whose SPIRIT will "Show Potential, Integrity, Responsibility, and Inspire Thousands!" Applicants submit an application, which describes your school and extracurricular life, and includes a speech. The rules for 2012-2013 have changed. Unlike the first two years, you no longer need to submit a YouTube video with the application. However, the 1st place winner is expected to produce a video for YouTube based on your speech by June 30, as a condition in order to receive the award. Acting on good advice from the staff at Wootton High, we changed application process as a means to best search for the who most deserves the SPIRIT scholarship. Applications will be accepted on a 1st come 1st serve basis to the first 50 applicants between February 1 through April 1. The annual SPIRIT Scholarship reward young people for good behavior, talent, and involvement in school and community. The first scholarship was awarded in 2011, to WHS grad Jeff Hilnbrand; and in 2012 to Isabella Mia Lee. We encourage everyone to apply. * Update 12/28/12 - The Foundation decided to simplify and eliminate the extra video awards of $100, while adding a runner-up award. You can Win the 2013 SPIRIT Scholarship. Robert Yin said, "I will create a better life for myself and others." Craft a speech and story about your idea or work to make a better life. Everyone remembers you, loves you, and misses you!